Ultra running legend Kirk Apt joins me on the podcast this time. If you don’t know Kirk, and you fancy yourself an endurance sportsman/sportswoman, then you probably ought to give a listen. Kirk is an extraordinary person and he just so happens to have finished forty-four 100-mile footraces (yes, 44!, as in almost 4 dozen — you read that right). 1. Eighteen of those finishes have been at the HardRock — clearly one of the toughest races on the planet with a top-out elevation of 14,042 ft and a total gain/loss of just a titch under 68,000 feet of climbing. 3. He’s not done yet! Kirk is gonna race and finish for the foreseeable future. In this podcast we discuss training and racing (of course), but Kirk is also a PhD-level student of the mental and spiritual aspects of ultra-sport, so he has some great insights in how any runner can approach their training, and keep themselves fresh. He has such a great attitude that you can’t help but look differently at your “boring” weekday runs and rides. Kirk is a practicing massage therapist and “Rolf-er”, and he brings the same amount of attention and focus to his work as he does his running — after talking with him about his approach to body-work it made me want to go out and start getting massages regularly again! Hope you enjoy, and, as always, leave me some feedback here or on whichever portal you downloaded this podcast from. 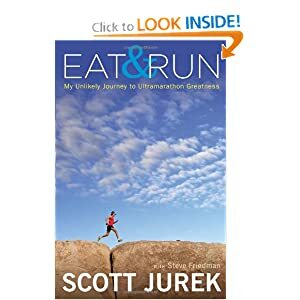 This weekend I started and should finish Scott Jurek’s new book. It’s a mix of autobiography and vegan recipe primer. Good read all around and I’m always eager for new food ideas….lots of good basics that would allow a fair bit of experimentation. I’ll post a more in depth review later. Multiple Ironman winner and all-around good chap, triathlete Ben Hoffman, sits down to chat. This was recorded in January of 2013 and it’s fun to listen to again, knowing what Ben was set to accomplish in the next two years — more Ironman wins and second at the World Championships in 2014. I missed The Infinite Monkey Theorem during the chat, and was kicking myself afterward….awesome wines, even if you don’t know a thing about grapes you’ll still enjoy their offerings. Enjoy; I know I had a good time chatting with Ben. Up next on the podcast, an ultra running legend (which should really apply to anyone who’s completed 44 [yes forty four!] 100 mile foot races, even without the big results this athlete and seeker has had. More later…..